Wilson, who competed in the 2008 edition of the race onboard GA3 came in 9th place of 11 finishers out of 30 starters. Great American 3 was also refit at MYC. 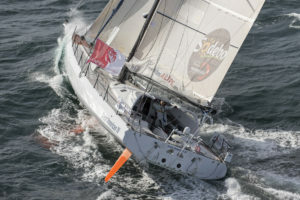 For the 2016 edition, Wilson purchased a new Open 60 in France and sailed the boat across the Atlantic to MYC for the critical refit and preparation necessary for the 2016 race. This boat, named Great American 4 is a much newer, more powerful and more technologically advanced Open 60 than Wilsons previous boat. The refit covered all aspects of the boat. Removal of the canting keel and servicing of the bearings and hydraulic rams. Removal and service of the twin dagger boards and bearings. Removal of the twin rudders and steering system and complete service of the bearings and steering gear. Servicing and updating the Harken pedestal driven winch system. Inspection and service of the carbon mast and all halyard locks, including EC6 standing rigging and replacing textile backstays and textile anti-torsion headstays. Upgrades included: modifying interior structure to create an area where standing headroom exists. Building a more ergonomic navigation station with a bench seat/crib that is capable of being adjusted via block and tackle to always remain level when the boat is heeled for a better sleeping position. New electrical system, panels, wiring and electronics including Lithium Ion batteries. New alternative energy charging system including solar, wind and dual transom hung hydro generators. New B&G sailing instrumentation along with redundant autopilots and gyro compasses. Installation and integration of computer systems, several different large band width satellite communication systems and camera systems for onboard video. The entire crew at MYC wishes Rich the best of luck and we will all be following the race.